Thanks for your interest in purchasing The Epsilon Outcome. Your support will go a long way in encouraging future developments of this and other projects, as well as ports to other platforms. Beyond the digital download, there's more available. All secure marketplace transactions go through PayPal, where all major credit cards are accepted. Shipping and handling charges for physical purchases are included in each price. Each purchase includes an e-mailed link for digital downloads. The full version, available on a commemorative retro-ly labeled CD-ROM. All of the music from the game is in this compilation. Also includes four deleted songs that didn't make it into the game. All options come with a digital download of all songs in .MP3 format. Click here to see a list of the songs (opens a popup). 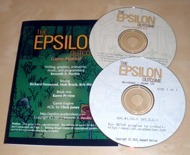 This exciting package includes an Epsilon Outcome installation CD as well as a brand new, clean, official user's manual. As a bonus, the soundtrack CD is also included, as well as digital downloads. What in the world does this thing do?